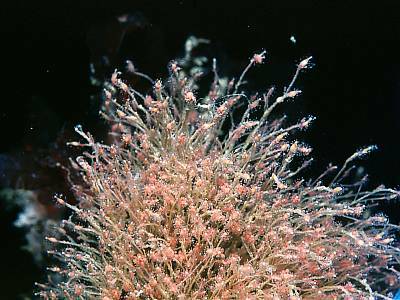 Description: This hydroid forms straggly masses of fine tubular stems with pink polyps at the tips. The polyps consist of an elongate body bearing tentacles with knobbed tips scattered around the body in an irregular arrangement. Main stems measure 30mm in length and individual polyps about 3mm. Habitat: Found attached to kelp fronds and rocks in shallow water exposed to strong tidal streams. Distribution: Widespread around the British Isles. Polyps with knobbed tentacles arranged irregularly on the outside of the body. A mass of fine tubular stems like miniature Tubularia larynx. Picton, B.E. & Morrow, C.C. (2016). Sarsia eximia (Allman, 1859). [In] Encyclopedia of Marine Life of Britain and Ireland.